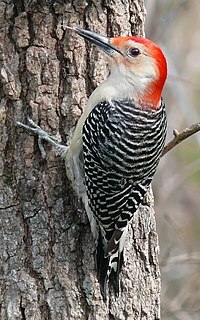 January 13, 2011, sighted for the second time this season a Red-bellied woodpecker (male) at a suet feeder on Dudley Rd. December 15, 2010, sighted a pair of Red-bellied woodpeckers (separately) feeding on mixed seed on the ground under my bird feeder on Dudley Rd. A misnomer, they do not have red bellies; the male has a red crown and nape, the female, only a red nape! stripes, a touch of yellow in its wings and base of tail. The flock did not remain into the next day. November 23, 2010, A male Pileated Woodpecker (up to 20” in length) visit ed the backwoods behind my house. When it flew most striking were the large flashing white patches on the underwings against the black body. When it landed on a dead tree the very red crest was evident and through the binoculars looked like a huge flaming-red helmet. Large oblong holes in the tree’s trunk showed where the bird was feeding (carpenter ants). What caught my attention at first was the LOUD irregular kik-kik call like that of a Flicker.